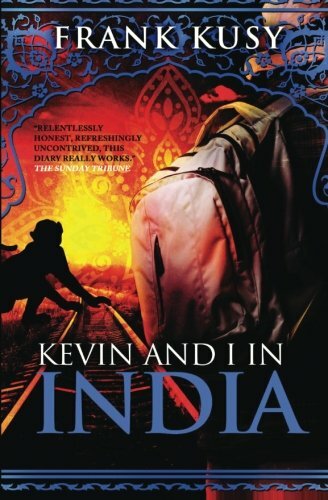 On his flight to the Indian sub-continent, Kusy meets the only other Englishman on his flight, Kevin, whom he agrees to travel with through India. As an aspiring Buddhist, Kusy was there for the "spiritual" India. Kevin, bizarrely, was there for a holiday. Whilst this sounds like a prelude to a backpacking installment of The Odd Couple, the reality is that Kusy and Kevin by and large seem to be perfect travelling companions and become inseparable for the next 3 months after landing in New Delhi, up until when Kevin flies back home due to lack of funds and Kusy is left to see more of Nepal and Rajasthan on his own. Kevin and I in India concentrates more on the difficulties and real-life experiences of travelling around India, than the glossy brochured (or in these days Instragrammed) version that travel agents would like you to see. As such there is plenty of descriptions of flea ridden dogs and beds, cockroaches, feces eating pigs, open sewers and general squalor nestled amongs the beautiful sights of the Taj, Fatehpur Sikri, Shree Meenakshi, Ellora Caves, Goan beaches, Kerela backwaters and burning ghats of the Ganges. For those who have been to India, the book will immediately transport you back there with scenes of its beggars, rickshaws, holy cows, saddhus and temples and earthenware teacups handed out by Chawallahs easily visualised from Kusy's writings. There's also the remembrances of train ticket queues and "purgatory" rooftop and buttock numbing journeys aboard buses, boats trains and tuk-tuks. "Express trains", taking 41 hours to travel 2,175km provide a timely reminder of why the advent of cheap flights these days may indeed be not such a bad thing! Underpinning the book is Kusy's obvious love of the country and which has seen him continuously return there. But whether it is the funny Indian "signs", beautiful sights encountered or simply dealing with the hardships of daily travel, Kevin and I in India ensures a great read of the ultimate backpacking trip through India in the 80's. Told in raw and honest fashion the story doesn't try to sell you India, but everything about it screams out just how amazing this country is and why every backpacker worth his or her salt, should definitely get there at some point in their life.